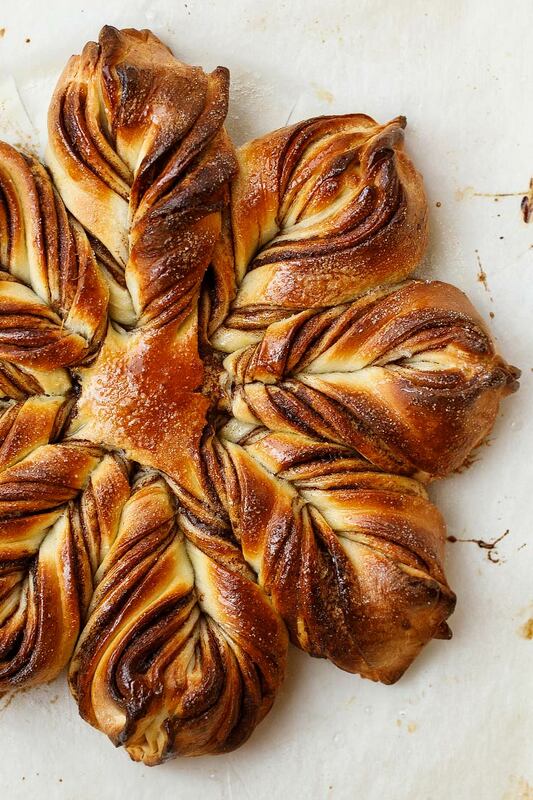 Chocolate Hazelnut Star Bread is a stunning addition to any holiday table! Makes 1 star loaf. 2 tsp Amoretti® Chocolate Crème de Cacao Extract O.S. In the bowl of a stand mixer, whisk together lukewarm water and yeast. Sift together flours, powdered milk, sugar, and salt. Add to mixer. Add the butter, Madagascar Bourbon Vanilla and Chocolate Crème de Cacao Extract. With either the dough hook or paddle attachment, mix until dough forms. Remove the dough from the bowl and knead for about 8 minutes until it is soft. Place dough in a lightly greased bowl, turning to coat, and let rest in a warm place for 45 minutes. Remove the dough, divide into four equal pieces, and roll each one into a ball. Place the balls back into the bowl, cover, and return to a warm spot for 15 minutes. On a piece of parchment the size of a quarter sheet pan, roll out one of the balls into a circle about 10” in diameter. Egg wash the edge of the circle, about ¼-½“wide. 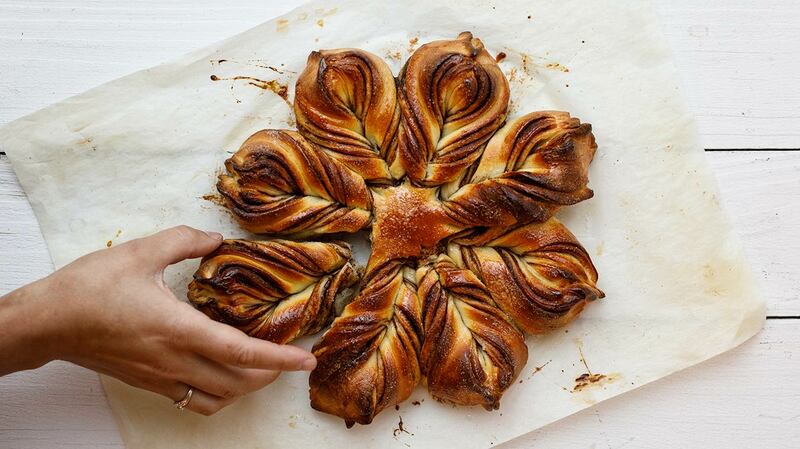 Spread approximately 1 tbsp Hazelnut Dark Chocolate Spread over the dough, just up to the egg-washed edge. Sprinkle approximately ⅓ of the cinnamon sugar over the top. Roll out the second ball of dough and lay it on top of the first circle, repeating the egg wash, Hazelnut Dark Chocolate Spread, and ½ of the remaining cinnamon sugar. Roll out third ball and repeat steps 11-13 once again. Roll out the final ball of dough and place on top,(the fourth layer will be left clean on the top). Place a 2” cookie cutter or small bowl in the center of the dough. Using a pizza cutter or knife, make 16 slices from the outer edge to the cutter or bowl, so that there is a circle in the middle, free of slices. Remove the cookie cutter or bowl. Holding two strips turn them outward, away from each other, three times and pinch the ends together. Repeat with the rest of the dough strips. When finished you should have eight arms of dough. Slide the parchment paper with the dough onto a sheet pan. Cover and rest for 45 minutes in a warm spot. Brush the top of the dough with the beaten egg and dust lightly with sugar. For a shine on the bread, brush with a small amount of simple syrup after baking. SIMPLE SYRUP Heat ¼ cup each water and sugar to boiling then remove from heat. Cool and keep covered in refrigerator for up to one week.